The story of the BERLIN-MARATHON is a story of the development of road running. When the first BERLIN-MARATHON was started on 13th October 1974 on a minor road next to the stadium of the organisers‘ club SC Charlottenburg Berlin 286 athletes had entered. The first winners were runners from Berlin: Günter Hallas (2:44:53), who still runs the BERLIN-MARATHON today, and Jutta von Haase (3:22:01). It was not until 1980 that the marathon route led the runners along the Grunewald, a forest in West Berlin. The maximum participation in those days was 397 in 1976. But already during the early stages there was a world record. In 1977 the national marathon championships were held at the event for the first time. Women’s winner Christa Vahlensieck set a new world best clocking 2:34:47. It was also in 1977 when there was a reasonable good men’s winning time: British runner Norman Wilson won in 2:16:20. September 27, 1981 was a big day for the organizers of the SC Charlottenburg. For the first time the BERLIN MARATHON was run through the city streets of West Berlin. The race was started in front of the Reichstag and finished on Kurfürstendamm. But it had been hard to persuade the local government and the police to move the race into the city. Ian Ray (Great Britain/2:15:41) was the first winner. Angelika Stephan from Kassel (Germany) won the women’s race in 2:47:23. 3,486 runners from 30 nations participated in the race – the largest field ever in a marathon in Germany. Quality of the BERLIN MARATHON then improved from year to year. And numbers of participants strongly increased from 1981 onwards. In 1985 more than 10,000 entries were registered for the first time (11,814). What an outstanding race. They battled it out and in the end it took the second fastest time ever to win it. Congrats! And look at the 40-49 age group. It took 2:10 to be that age-group winner. 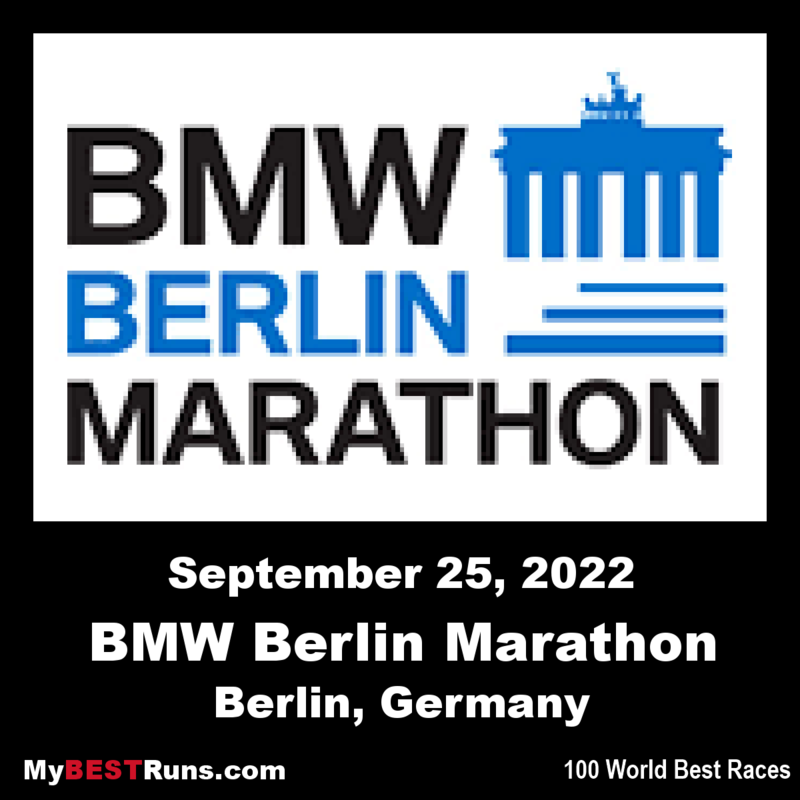 Looks like the upcoming Berlin Marathon is really going to be first class. Wilson Kipsang (Kenya) and Kenenisa Bekele (Ethiopia) are going after the world record. The 33-year-old took more than a minute off the previous best which was set by compatriot Dennis Kimetto when he ran 2:02:57 in Berlin in 2014. "It was hard," Kipchoge added. "I ran my own race, I trusted my trainers, my programme and my coach. That's what pushed me in the last kilometres." 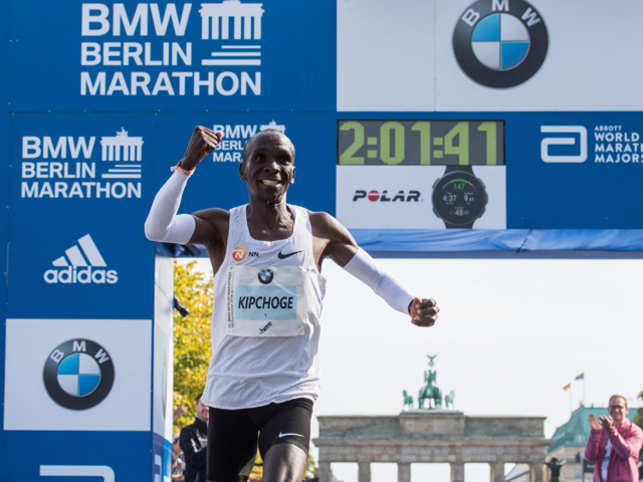 In a stunning display of distance running, Olympic champion Eliud Kipchoge broke the world record* at the BMW Berlin Marathon on Sunday (16), winning the IAAF Gold Label road race in 2:01:39. 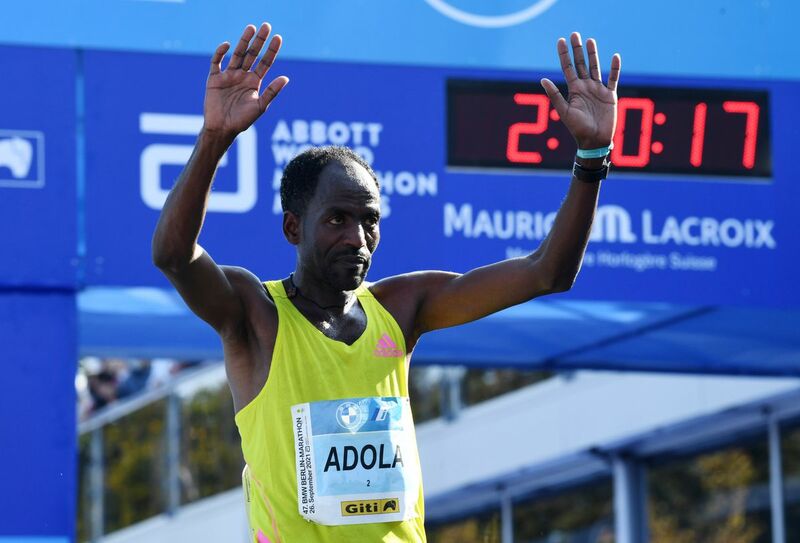 From the early stages of the race, the 33-year-old Kenyan had just a handful of pacemakers for company as they passed through five kilometres in 14:24 and 10 kilometres in 29:21. But shortly after 15 kilometres, which was reached in 43:38, two of the three pacemakers were unable to continue and withdrew from the race. The final pacemaker, Josphat Boit, led Kipchoge through the half-way point in 1:01:06 before dropping out at 25 kilometres, covered in 1:12:24. Running alone with 17 kilometres left, Kipchoge then sped up. He passed the 35-kilometre checkpoint just a shade outside 1:41:00, suggesting a finishing time inside 2:02 was possible. By 40 kilometres, reached in 1:55:32, a world record looked a certainty. Kipchoge maintained his form well in the closing stages and crossed the finish line in 2:01:39, taking one minute and 18 seconds off the previous world record set four years ago by Dennis Kimetto. It is the largest single improvement on the marathon world record since Derek Clayton improved the mark by two minutes and 23 seconds in 1967. "I lack the words to describe how I feel," said Kipchoge. "It was really hard [during the last 17 kilometres] but I was truly prepared to run my own race. I had to focus on the work I had put in in Kenya and that is what helped push me. I’m really grateful to my coaching team, my management, the organisation." Amos Kipruto finished a distant second in 2:06:23 while former world record-holder Wilson Kipsang was third in 2:06:48. Gladys Cherono made it a Kenyan double by winning the women's race in a course record of 2:18:11. Multiple world and Olympic champion Tirunesh Dibaba led during the early stages, passing through half way in 1:09:03. Cherono, Ruti Aga, Edna Kiplagat and Helen Tola were close behind, and when Dibaba started to struggle a few kilometres later, Cherono moved into pole position. Cherono, the winner in Berlin in 2015 and 2017, successfully defended her title in 2:18:11, taking more than a minute off the course record set 13 years ago by Japan's Mizuki Noguchi. Aga followed 23 seconds later to take second place in 2:18:34 while Dibaba held on for third place in 2:18:55. It was the first marathon in history in which three women finished inside 2:19.